Car sales are soaring, carmakers are hiring thousands of workers, and memories of the recent bankruptcies of two of Detroit's "big three" companies already seem like distant memories - even though fewer than four years have passed since the crisis. So it is a buoyant industry that is gathering at the Detroit motor show, which is scheduled to feature the unveiling of more than 50 new cars. "I think in Detroit you see things of an international nature that you don't necessarily see at other shows," Mark Reuss, president of General Motors North America, tells BBC News. But with light trucks - both pick-ups and sports utility vehicles (SUVs) - remaining central to GM's success, there will also be models on show that will be sold mainly in the US market, such as the upgraded Chevrolet Silverado and GMC Sierra models, according to Mr Reuss. 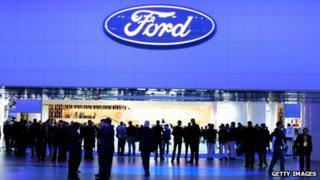 Ford's F-150, the best-selling vehicle in the US for decades, is set to be the chief rival. Other familiar names with new faces include the seventh generation Chevrolet Corvette muscle car and a refreshed, more upmarket Jeep Grand Cherokee, alongside imported models such as Bentley's ultra-fast Continental GT Speed Convertible, Maserati's all-new Quattroporte, the Mercedes CLA and BMW's 4-Series coupe. "In the US, we had an extremely strong month in November, and December was even stronger," BMW Group's board member in charge of sales and marketing, Ian Robertson, tells BBC News, predicting further strong growth ahead. Some 14.5 million cars and light trucks were sold in the US last year, a whopping 13.4% rise on 2011, and as such 2012 was the best year in terms of sales since 2007. GM predicts that sales will top 15 million in 2013 and perhaps even reach 15.5 million. But as 2013 gets under way, it is clear that the industry's revival is not reflected by the economic health of the city that hosts the show. Detroit has long been struggling to tackle a £327m budget deficit and it appears to be constantly on the verge of running out of cash. The situation is so serious that the State of Michigan government is considering intervening by appointing an emergency manager to take charge of the city's finances. Measures such as job cuts, pay cuts and changes to benefits for city employees are currently being pushed through to prevent this, as it is seen as a step only just short of bankruptcy. Economic growth in Michigan this year is expected to be weak at between 0.4% and 0.7%, and the unemployment rate is expected to fall only slightly from 8.9% in 2012 to 8.6% this year, according to the House of Representatives' and the Senate's fiscal agencies. As such, Detroit's and Michigan's economies have more in common with the European car market, where sales fell more than 7% last year and are predicted to continue tumbling in 2013. And the carmakers' responses to both Michigan and Europe are similar as well. None of the companies is expecting to rely too heavily on sales growth in either region.